A collection of essays searching for meaning in some intriguing places, from the sublime to the mundane. ...each of these essays is itself a kind of extended moment, within which Searcy pauses, turns ideas about, attempts to take it all in. Unstructured yet well fortified, Searcy’s long, hanging moments take on the contours of a rare, desperately private space. To join him there is to be astonished. 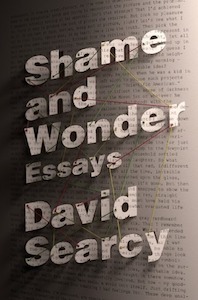 Each of these topics and so many more beget dazzling asides that, of course, turn out to be integral to Searcy’s apparent topic ... And that’s the point, really — what makes Searcy such a master storyteller is that he is a master observer, sharing his vision through essays that read like exquisitely crafted short stories. Searcy hunts for odd resonances and likes to get caught on the familiar corners of the world, turning them suddenly strange so you step back and see the ordinary world for the odd and lonely and magnificent thing it is ... But for every thought that emerges slow and lovely like a sunrise from an ordinary view, there's a clunker. The issue, I think, is that Searcy's writing, though searching and gorgeous and meditative and all that, lacks a sense of play and self-awareness. What did you think of Shame and Wonder?